When the world is going to hell in a handbasket, what can you do? You can look for solace in sport for a few glorious moments before you have to face reality again. 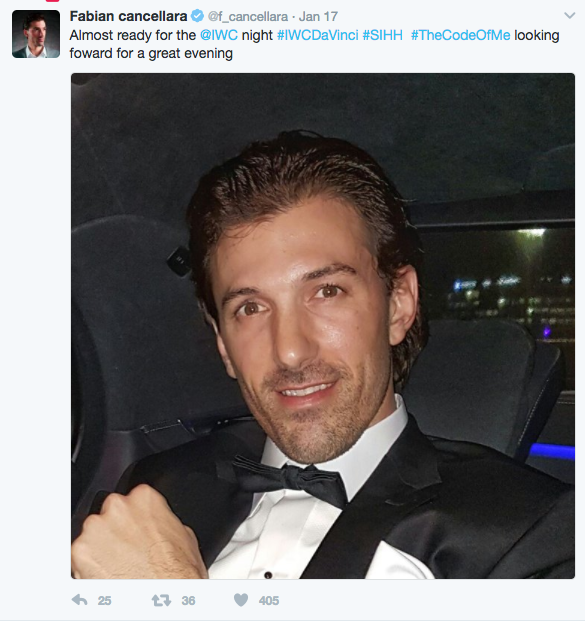 You have sanctuary here at Tweets of the Week. We have some racing, some dancing (Jagger style), a Wolfman and much more. 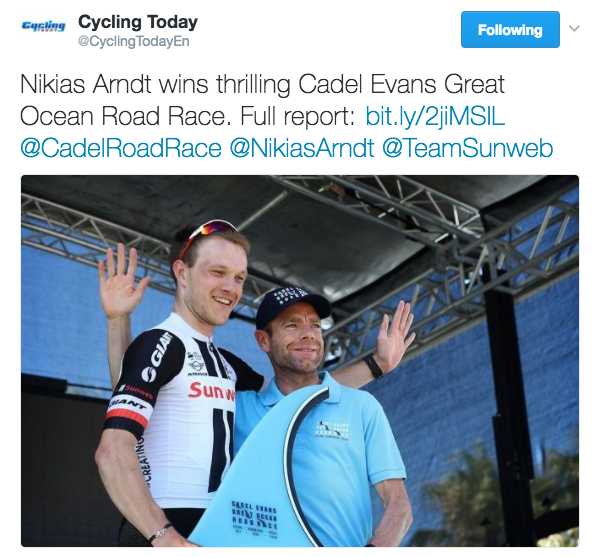 It was Cadel Evans Great Ocean Road Race this past weekend and it was fantastic to see Annemiek van Vleuten take the honours. 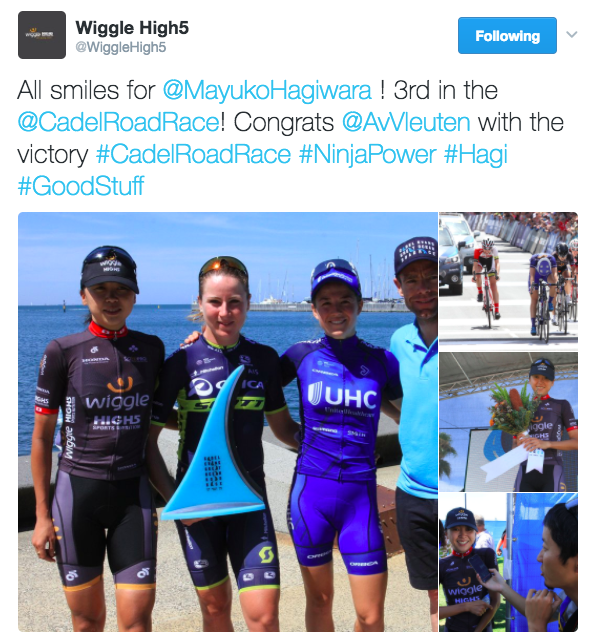 Fully recovered from her horrific crash at the Olympics, she’s certainly started the season with a swagger. 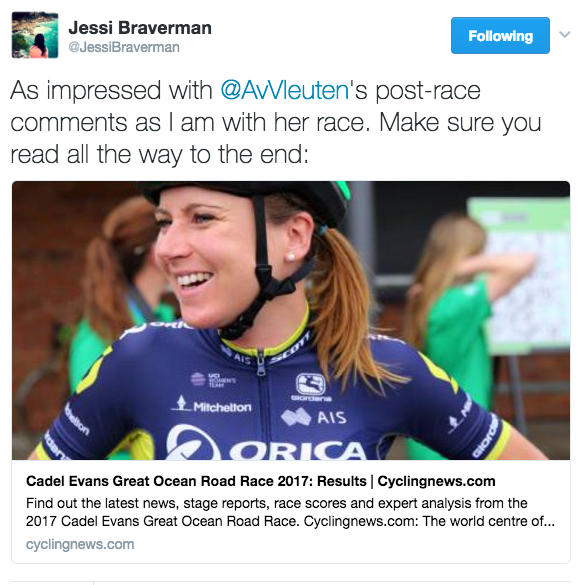 Here is the link to the feature mentioned in Jessi’s tweet below, if you want to read AvV’s thoughts on the past year are really rather beautiful. 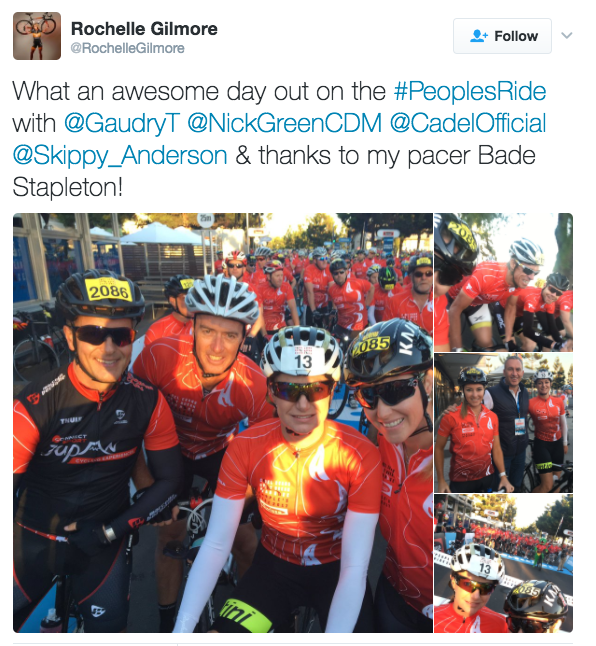 It looked like everyone in Australia was out on the road this weekend, including Rochelle Gilmore and … who is that guy in the second picture? 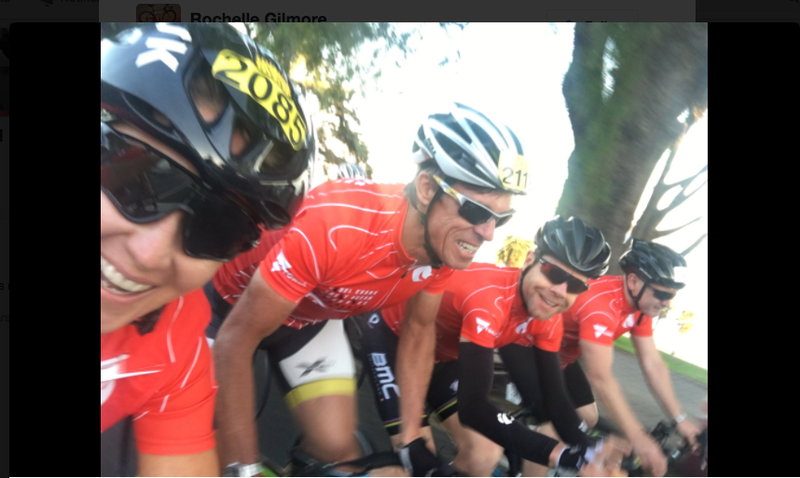 Why it’s Cadel himself! Two things about this picture. 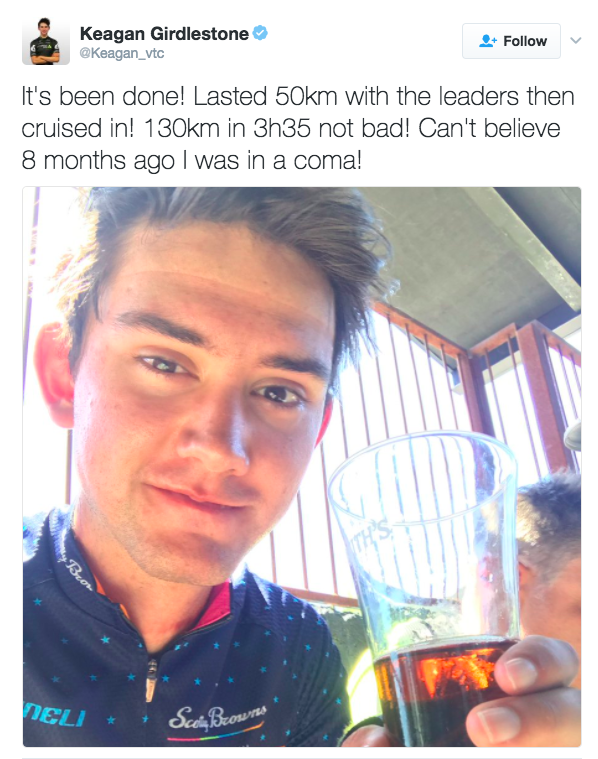 No, three, three things about this picture. 1) I still think the Morse code malarkey on the Sky kit is bewildering and, at best, silly. 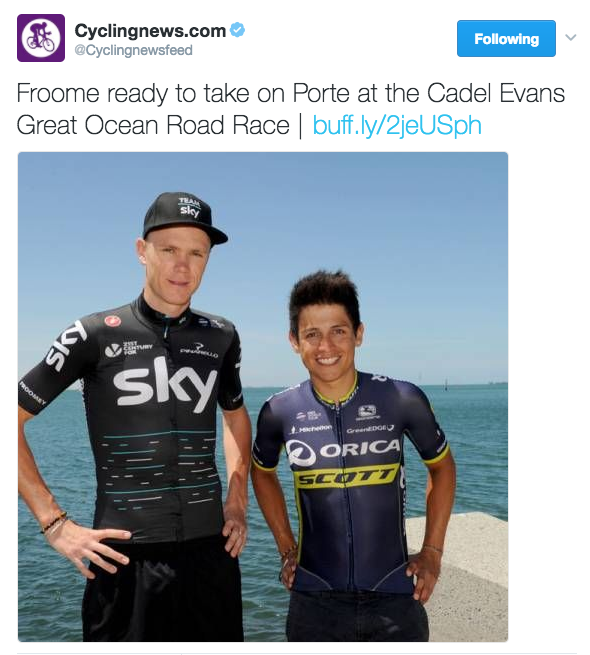 2) That isn’t Richie Porte. 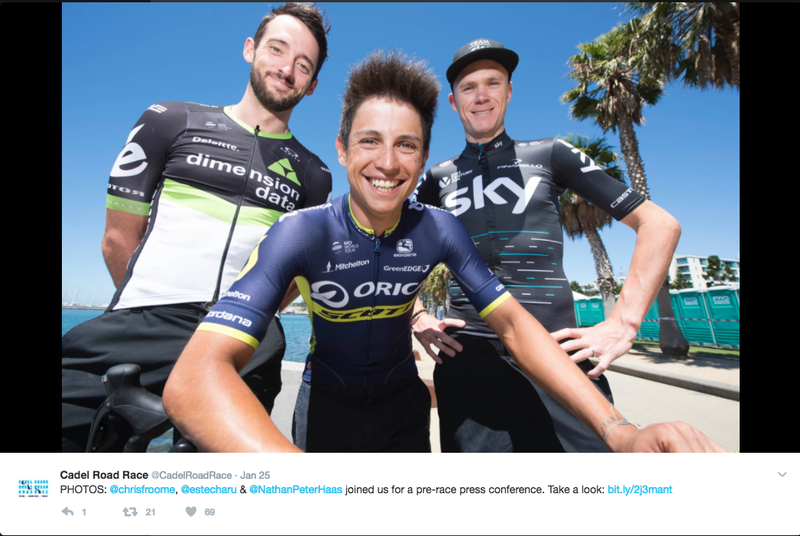 3) Chaves’ hair looks like it’s about to take off like a rocket. 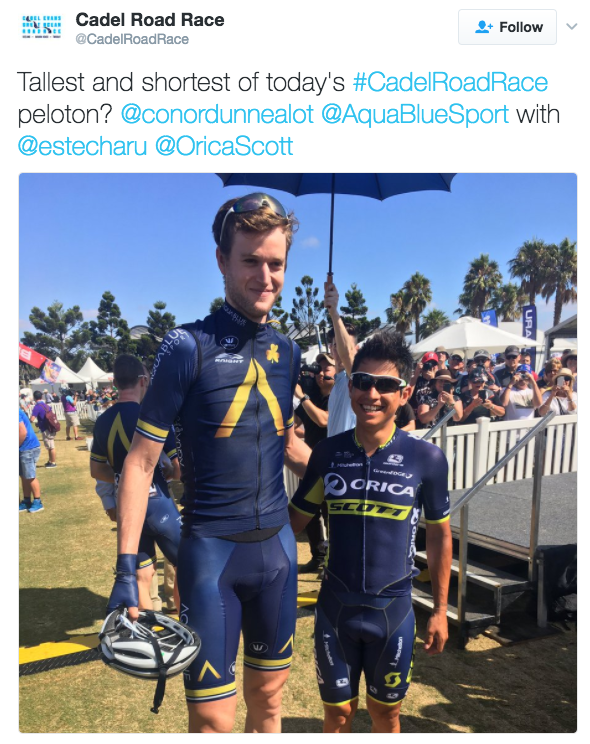 Just think if the Little Kangaroo had Conor Dunne (whose Twitter profile starts with ‘tallest cycling in the world’) as his windbreak for a race – match made in heaven, I reckon. 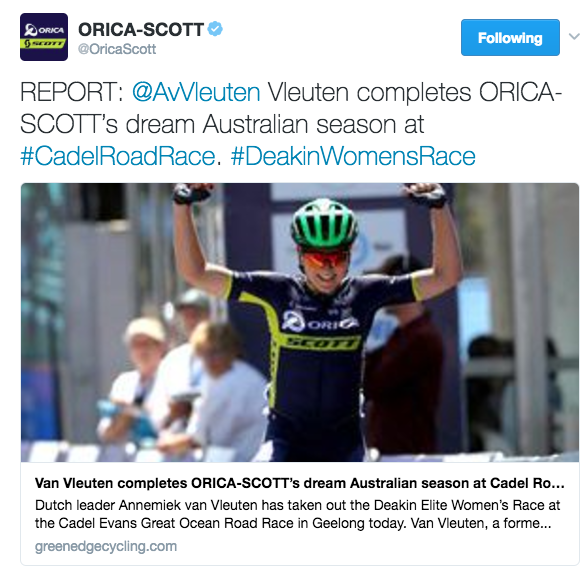 Orica – sign that man! 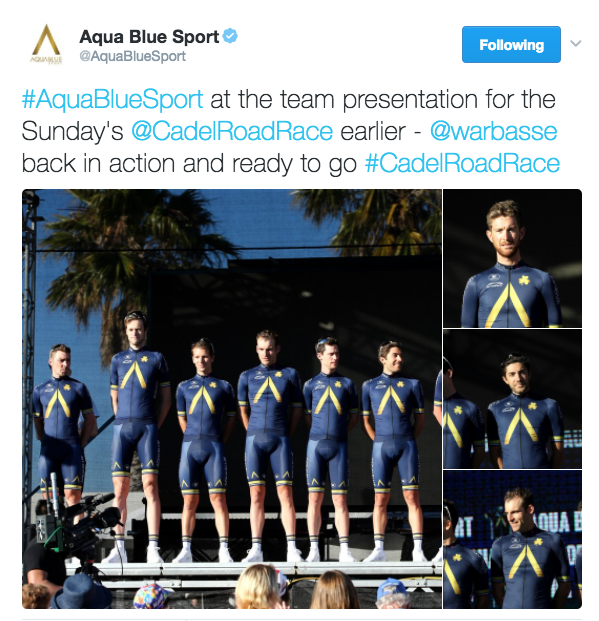 I’m unsure about that Aqua Blue kit though – it feels like the inverted V (or is it a chevron?) is too small or too high up or something. Not pleasing proportions. 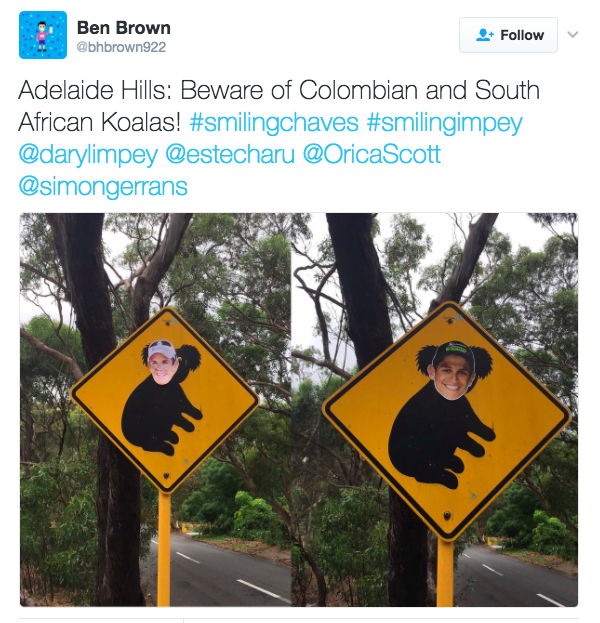 Those Chaves facemasks really get around. 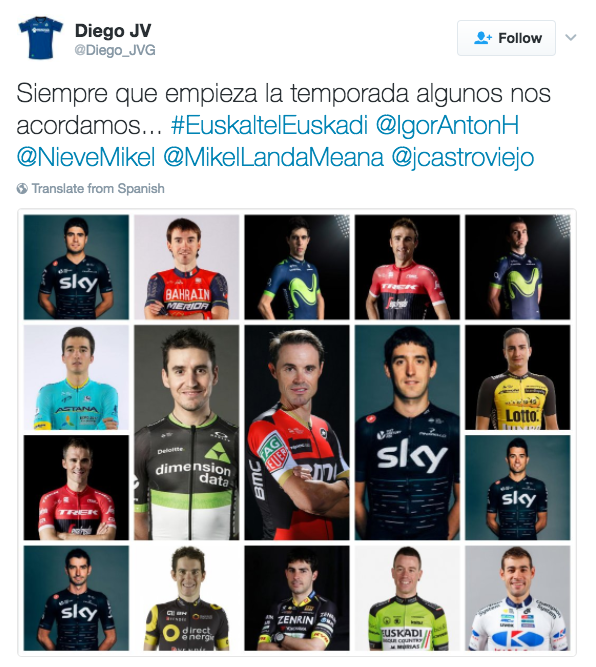 I wonder if I ask Orica very nicely if they would send me a stack so I can paste them up around London. This is how you get out of the way of your sprint train when your time is up on the front. 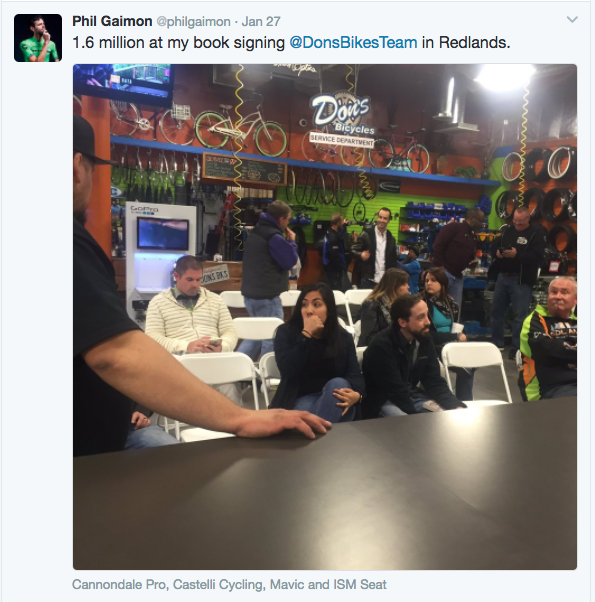 An interview with the Wolfman. 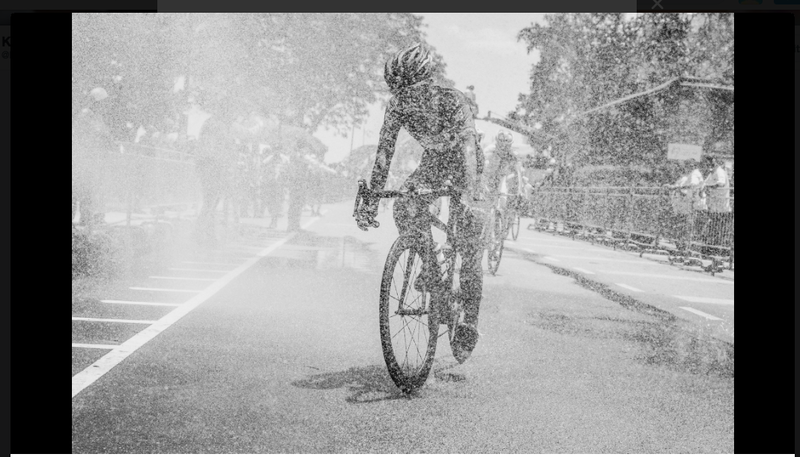 Never need an excuse to post up some great photographs by Marshall Kappel. 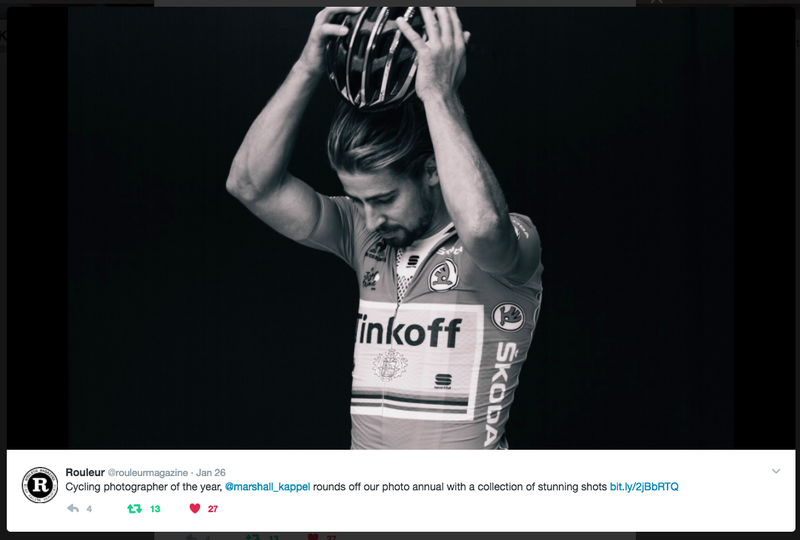 Make sure you have a look at his work on Rouleur’s online photography annual. These are just tasters to whet your appetite. 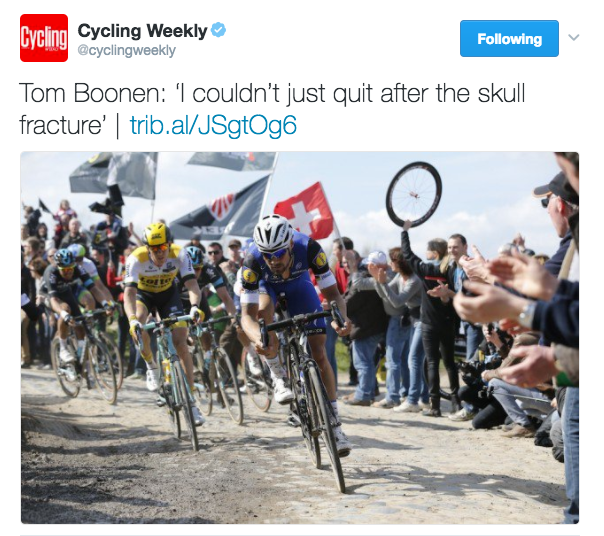 There aren’t many sports where this quote from Tom Boonen would sound reasonable. 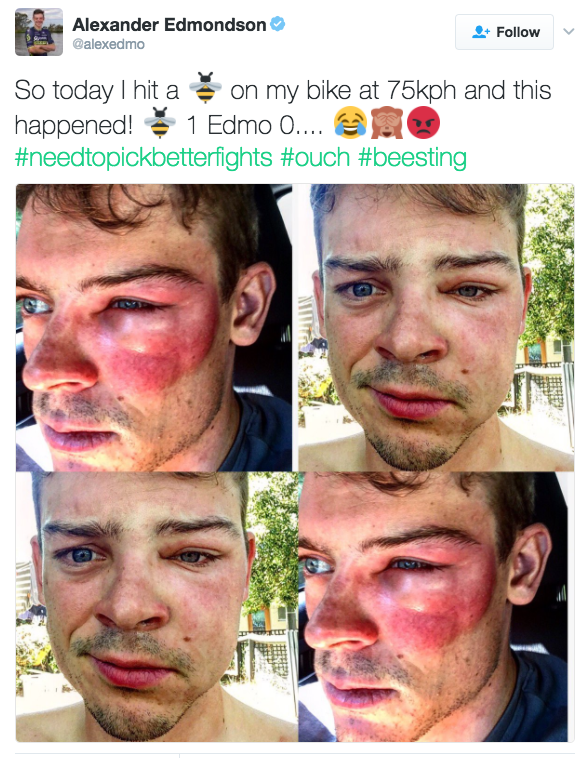 Poor Alex Edmondson looks like he just went 10 rounds with [insert name of a current boxer]. Those bees pack a punch. 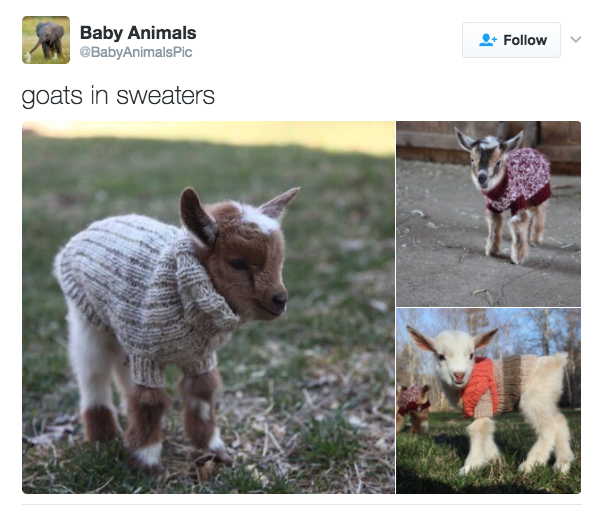 Sometimes the only thing left is to look at pictures of baby goats in sweaters. Life can be beautiful and surprising. Let’s hold on to that! 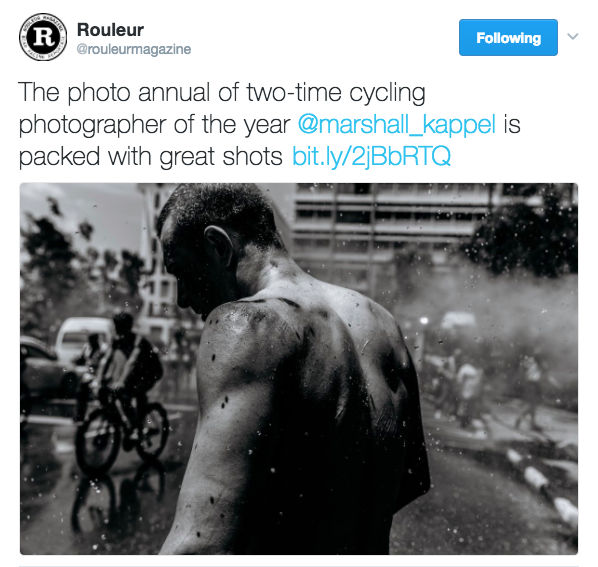 This is the last of Marshall Kappel’s advent calendar photographs, but he was so generous with us that he gave us a further five. Stay alert between Christmas and New Year as we’ll be posting up that bounty too (they’re too good to miss)! 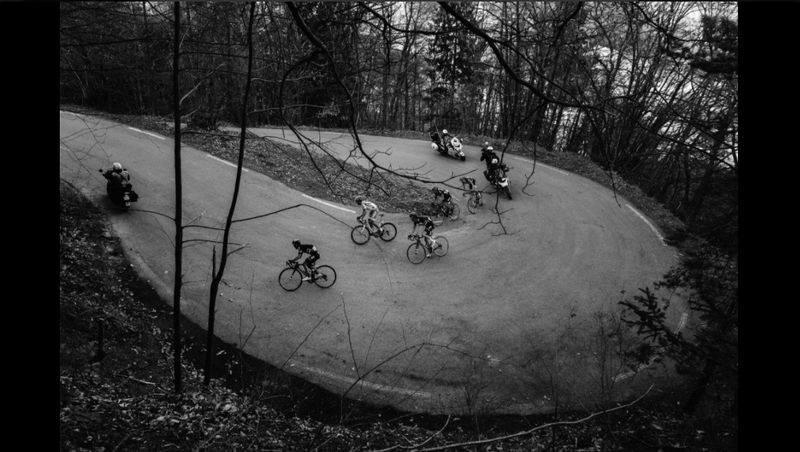 Today, however, we’re back on the Alpe with a certain Frenchman!